As I may have mentioned, I finally found those Kraft caramel bits at Target and have been wanting to use them. I knew I would make something salty-sweet, and a quick Google search later, I came across this recipe. Chocolate cookie, sea salt, chocolate chips, and caramel. Um, HELLO. These cookies taste as good as they sound. Chocolaty with a hint of salt (in fact, I would add more next time), chewy, and full of caramel pieces. I do have to admit they are better served warm, but that’s what the microwave is for, right? Bake at 350 for 8-10 minutes. Let cool completely. Don’t move the cookies to a cooking rack; either eat them or let them cool. Please check this out and let me know if it is OK. I swear from my dead dog’s grave, I saw this recipe from another blog. Whoever wrote this recipe first is a mystery for me, for all I know this Salted Chocolate Cookies with Chocolate Chips and Caramel Bits is awesome! Thanks for sharing this one. If you wont mind I’d love to guide Foodista readers to your post. Just add the foodista widget to the end of this post so it will appear in the Foodista pages and it’s all set, Thanks! Mmm…I can almost taste the chocolaty chewy goodness!! Salted caramel in cookies? Yes, please! I bet these are amazing warm, right out of the oven! These were really good. 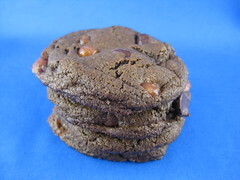 A rich and satisfyingly chewy chocolate cookie. Cutting up the caramels is a challenge – esp b/c I doubled the caramels to 16. For a few dozen cookies, I wanted to spread the caramel chewiness around some more – and what a success. Thanks for sharing!